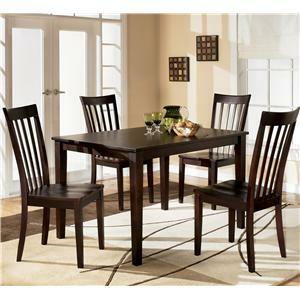 Bring contemporary style to your dining area with this glass top table and chair set. The mixed material construction of the tempered glass and wood base allows this table to keep any room it is placed in feeling light and open. This table is large enough to comfortably accommodate four people, but small enough that it still feels like a cozy place to enjoy long dinners with friends. 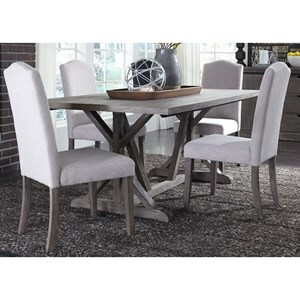 The stylish chairs add a sense of relaxed yet sophisticated style to this dining set. The Amalie Contemporary Five Piece Chair and Table Set by Steve Silver at Van Hill Furniture in the Grand Rapids, Holland, Zeeland area. Product availability may vary. Contact us for the most current availability on this product. The contemporary design of this collection has been infused with simply elegant style. 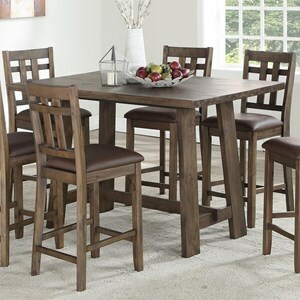 This creates a look that is modern yet sophisticated, and most importantly, inviting for your dining area. The Amalie collection is a great option if you are looking for Contemporary furniture in the Grand Rapids, Holland, Zeeland area. Browse other items in the Amalie collection from Van Hill Furniture in the Grand Rapids, Holland, Zeeland area.